Gypsy Rose is a beautiful cuff featuring a triangular cut Agate stone set at an angle. 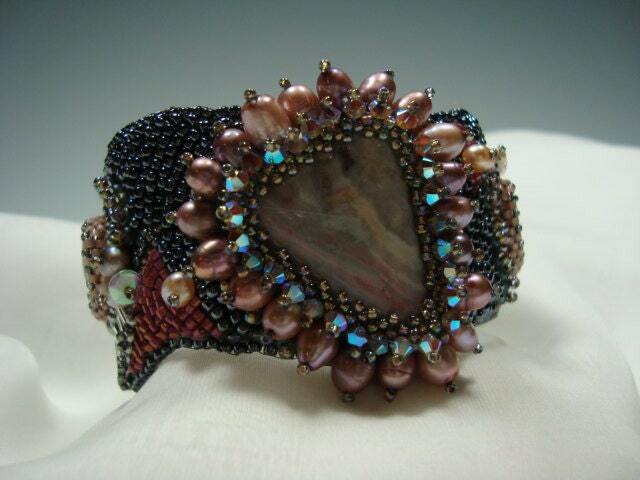 Surrounding this stone, that has shades of mauve and gray, are Swarovski crystals as well as freshwater pearls. The sides of the cuff are accented with tear drop Agate stones and more freshwater pearls.The cuff is mounted on a wavy brass base that reflects the calm wavy mood of the entire piece. Lined in soft gray Ultra Suede, the cuff is adjustable to fit any size wrist.